The match official and the Air Canada Centre announcer team up. EVENTS TOOK A decidedly nuts turn in the Toronto Raptors 94-87 home defeat to the Brooklyn Nets in Game One of their NBA playoff encounter. Prior to the game, and Toronto’s long overdue return to post-season basketball, Raptors General Manager Masai Uriji got a little carried a way. Addressing legions of Raptors fans at a pre-game rally, he bellowed ‘F*** Brooklyn’ before dropping the microphone and strutting off. Then, during the match, the Raptors lost a 50-46 lead at half-time as their shot percentages tanked in the third and fourth quarters. The shot clock also gave out in the fourth quarter and, with no replacement available, an official stepped in with a stop-watch. He was tasked with being the 24-second shot clock and nudging the PA announce beside him. The announcer would then yell out ‘Horn’ every time that 24 seconds elapsed. Veteran Paul Pierce came to the fore in the final quarter and Deron Williams drained 24 points on a crazy afternoon in downtown Toronto. Game Two takes place on Tuesday. We assume the shot clock will be fixed by then. 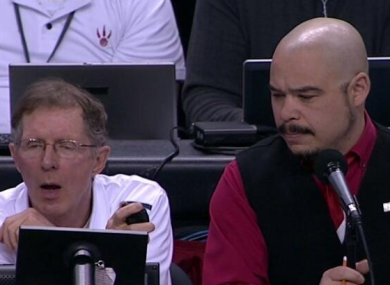 Email “Human shot clock forced to yell out 'Horn' every 24 seconds in NBA playoff match”. Feedback on “Human shot clock forced to yell out 'Horn' every 24 seconds in NBA playoff match”.